Save Our Post Office / Save Our LJCPA’s Creditability! By: Bob Whitney; Letter to the City Attorney. It is easy for violations of the LJCPA volunteers to be shrugged off as insignificant and regarded as LJCPA “housekeeping”. Housekeeping however is not the point of this letter. The point is La Jolla has a systemic problem in which activist members of our community planning group are using the community planning process to promote “themselves” and/or advance their predetermined personal agenda. When confronted, the issue is quickly described as an “isolated housekeeping issue” or a “complaint without merit”, with no repercussion or consequence to the violators. I have witnessed reasonable Trustees and LJCPA members seemingly grow frustrated and aggravated as our community planning process is manipulated. I have witnessed this scenario played out over and over at an enormous dollar cost to applicants and an equally immeasurable cost to our community as the integrity, creditability and transparency of the LJCPA erodes away. I recently attended both the February 2nd and the March 1st publicly noticed meeting of the LJCPA. At their February meeting; items (4) & (6) on the agenda were announcements (non-action items) made by Erin Demorest, from District 1 Office and Joe La Cava, Vice President of the LJCPA respectively, of a planned rally to save the La Jolla post office building. The rally was to be held Saturday, February 4th at 9:30 A.M. at the La Jolla Historical Society. At the March 1st meeting Item 8.D on the agenda, was an action item which passed by an 11-1-1 vote. The approved motion was “That the President draft a letter to support the La Jolla Historical Society’s efforts to save the La Jolla Post Office”, nothing more or nothing less. This motion did not grant or authorize the “La Jolla Historical Society”, “Saveourpostoffice.org” or “Save Our La Jolla Post Office Community Task Force” permission or authorization of the use of the LJCPA email. Although I fully support the community effort to save our Post Office, I objected in writing, to the predetermined use of the LJCPA’s email list without; a public notice, public comment, or a public vote by the Trustees of the LJCPA. Pursuant to the Bylaws of the LJCPA, my written grievance was referred to the Officers of the LJCPA for investigation. On June 7th 2012 I received the results of this investigation . The response from Trustees; Joe La Cava, Orrin Gabsch, Dan Allen and Jim Fitzgerald was as follows; “The letter alleges a Brown Act violation because an email announcing a community meeting was sent out before the matter was considered by the LJCPA. In other words, alleging that whether to send such an email constitutes an action by the LJCPA and therefore can only be done after due consideration at a publicly noticed hearing. The facts are simple on this issue. At its publicly noticed regular meeting on March 1, 2012, the LJCPA took an action to “draft a letter to support the La Jolla Historical Society’s efforts to save the La Jolla Post Office”. The motion passed on an 11-1-1 vote. Emails sent out by the LJCPA on April 16 and 23 announcing the “Save the La Jolla Post Office” community meeting is a logical extension of the LJCPA’s action. This first allegation has no merit based on the facts and is rejected”. The LJCPA officers are correct; “The facts are simple on this issue”; their investigation confirms my grievance has merit and their response is at best disingenuous. First; the purposes of the Brown Act is to allow the public to attend, observe, monitor, and participate in the decision-making process at the local level of government. 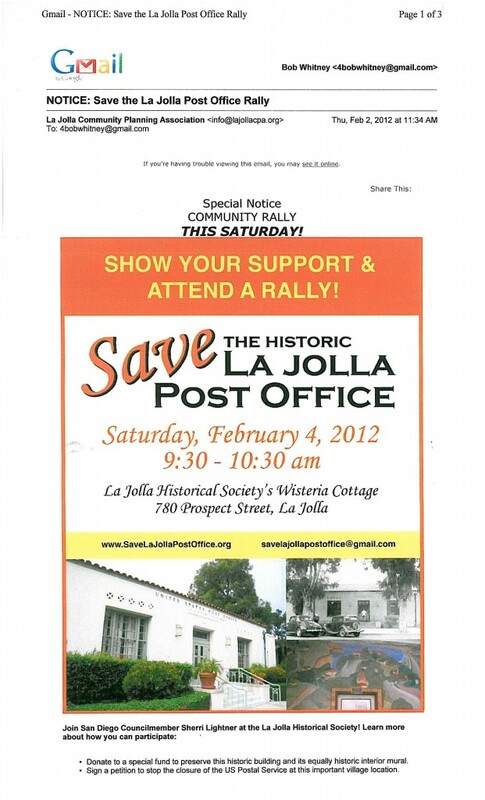 On February 2, 2012, the LJCPA sent out an email via info@lajollacpa.org , announcing a community rally to save the La Jolla Post Office (Exhibit A). Contrary to the above Trustee’s internal investigation, an email was broad-casted from info@lajollacpa.org 30 days prior any action taken by the LJCPA at a publicly noticed meeting. Second; their hypothesis of sending emails via info@lajollacpa.org is a “logical extension of the LJCPA action” of their March 1st vote has no logic. This logic once again merely permits activist Trustees to arbitrarily circumvent the Brown Act, Council Policy 600-24 and the LJCPA bylaws when they perceive it necessary to promote their own predetermined agenda. Their theory is not substantiated by the following sections of the Ralph M. Brown Act. Section 54950 declares … “The people, in delegating authority, do not give their public servants the right to decide what is good for the people to know and what is not good for them to know”. Or Section 54954.2 which decrees; No action or discussion shall be undertaken on any item not appearing on the posted agenda….” Nor does Section 54954.3(a) which assert … “No action shall be taken on any item not appearing on the agenda unless the action is otherwise authorized by subdivision (b) of Section 54954.2”. Additionally, their assertion is not substantiated in City Council Policy 600-24. Article 1 Section 4 which declares; the official positions and opinions of a recognized community planning group shall not be established or determined by any organization other than the planning group, nor by any individual member of the planning group other than one authorized to do so by the planning group. Their assumption is also not supported by the LJCPA Bylaws. Article 1 Section 3 states; the official positions and opinions of the LJCPA shall not be established or determined by any “organization other than the corporation”, nor by any elected Trustee of the LJCPA, other than one authorized to do so by the corporation as a result of a vote taken at a noticed LJCPA meeting. Third; Based on city staff’s investigation of this complaint it appears the Council District 1 office (Sherri Lightner), Mr. Tony Crisafi (President of the LJCPA) and Save the La Jolla Post Office Community Task Force (Joe La Cava President of the CPC) made the decision to use the LJCPA email prior to the February 2, 2012 email blast and prior to the LJCPA’s March 1st vote. This collective concurrence occurred, in violation of the Brown Act, Council Policy 600-24 and the LJCPA bylaws a month before the March 1, 2012 vote by the LJCPA. Our community either needs new housekeepers or the current housekeepers need additional guidance immediately. It is time for the City to take the “Do Not Disturb” sign off the door of the La Jolla Community Planning Association. It is absolutely unreasonable and inequitable for the City of San Diego to continue to ignore repeated violations of our community group, than turn around and indemnify this group with taxpayer’s money. They can not continue to circumvent the Brown Act, Council Policy 600-24 and their own city approved bylaws when they perceive it necessary to promote their own agenda. Given the above facts our community should know; (i) who has authorization to use LJCPA email list for unrelated LJCPA business? (ii) Who designed and created the February 2nd flyer? District 1 Office, LJCPA or the Task Force? (iii) Why did not the officers of our community group disclose the involvement of District 1 Council Office in their investigation? (iv) Have all the Trustees of the LJCPA and subcommittee members attended or completed the city required Community Orientation Workshop recently?